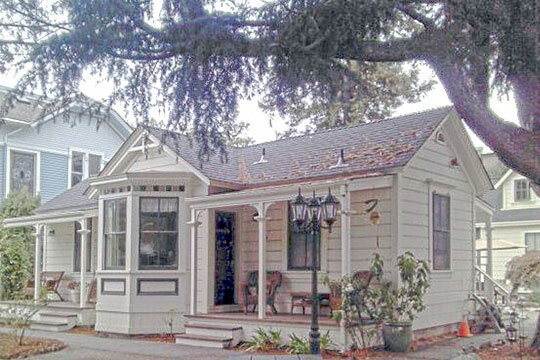 Photo: Carmelita Cottages, ca. 1872, 315-321 Main Street, Santa Cruz, CA. Listed on the National Register of Historic Places in 1986. Photographed by User:Anna Brooks (own work), 2012, [cc-by-3.0 (creativecommons.org/licenses/by/3.0)], via Wikimedia Commons, accessed November, 2013. Santa Cruz County administrative offices are located at 701 Ocean Street, Santa Cruz, CA 95060; phone: 831-454-2100. Santa Cruz County was created in 1850, one of the original counties established after statehood. First named Branciforte, after a 1797 Spanish pueblo, the name was shortly changed to Santa Cruz (Holy Cross). The original Mission Santa Cruz was destroyed by an earthquake in 1857.